A bit more relevant detail on this slide from my Jargon Buster piece: On December 8, 2010, during his keynote for the SAP Influencer Summit, SAP's Peter Lorenz, Executive Vice President of SAP's On-Demand Solutions, announced new SaaS platform names and a clarified vision for SAP's OnDemand applications. Billed as a "Unified technology stack," SAP's OnDemand architecture will be standardized on a Platform as a Service (PaaS) offering that includes "Next Generation Core," based on the Business ByDesign architecture, and "Next Generation Edge," a lightweight platform that merges SAP's lighter weight SaaS technologies including River and Oxygen (Oxygen being the environment in which SAP StreamWork was built). 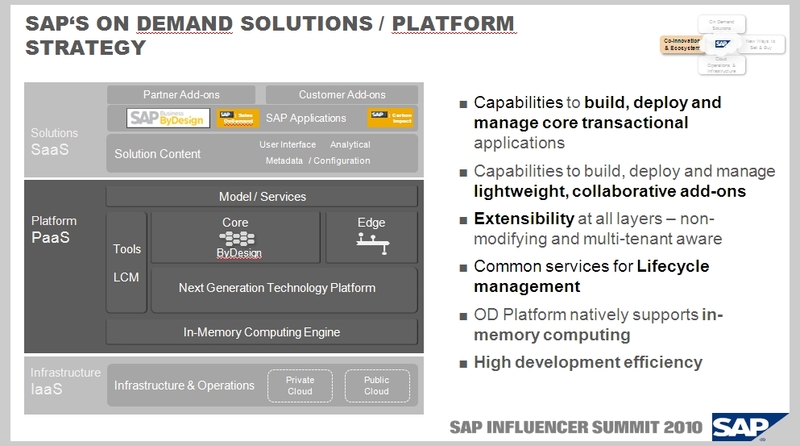 SAP's new PaaS also provides a framework for UI enhancements for SAP applications, as well as a connection point to SAP's Infrastructure-as-a-Service (IaaS), which is where SAP's much-discussed "in-memory computing engine" that powers HANA fits into the picture. SAP will not rewrite all existing OnDemand apps for this new platform (example: Sourcing OnDemand will remain on "Frictionless"), but you can expect SAP to address platform confusion by ensuring all future OnDemand apps are built on this "unified stack" with "Next Generation Core" or "Edge" technologies. More SAP PaaS details here.